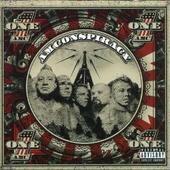 Former Drowning Pool vocalist Jason “Gong” Jones returns with AM Conspiracy and the quintet’s eponymous 14-track excursion. Meshing the heavy accessibility of Gong’s past group with an arena-rock immensity championed by the likes of Godsmack and Disturbed, this troupe dials in the middle of the road, paint-by-numbers hard rock formula as a template for their multi-faceted grungy modern rock meets nu-metal assault (“Myself,” “Far”). Brazen with an exceptionally in-your-face bass performance, intense guitars that take a page or two from Sevendust here and there and a vocal style that can rip out a roar as easily as croon with convincing emotion (“Down”) -- even though much of their presentation is bogged-down with derivations straight from the commercial rock carousel featuring Shinedown, Soil, and Saliva to be considered mandatory listening -- AM Conspiracy’s songwriting techniques seem custom made for today’s rock radio in mind and prove durable enough to go toe to toe with any other band on the circuit. For more information, check out http://www.myspace.com/amconspiracy.